Can you use a treble hook? What kind of string and hooks do you recommend? Thanks! Treble hooks can be useful for holding your bait in place securely. However, you need to know that not all locations allow you to use them. You don’t want to get yourself into trouble for using them in the wrong locations. You need to find out the fishing details for a given state or location before you assume that you can use them. Keep some in your tackle though so that if it is legal and you have a need for them, they are on hand. I tend to stick to the smaller treble hooks. They are easy to work with and they are more powerful than they look. I recommend using line that is very strong for the type of fishing you are going to do. You don’t want to save a small amount of money on the line and then it breaks as you are reeling in the fish you have caught. What type of halibut tackle do you recommend I go out with? What hooks do you use to catch a flatfish? The lure was painted or had fluorescent rings around it and they worked it in a figure 8 at the lights. Have you ever seen this and know what it’s called? Dan Eggertsen is a fellow saltwater fishing enthusiast to the point of obsession. :) He's been providing solid advice on saltwater fishing since 2004. How can we have the best experience tuna fishing in Key West? any tips to make me a better saltwater angler? How much should I plan to spend on a salt water fishing boat? New Jersey has a lot of fishing charters, how can I be sure to use the right one? am looking at Daiwa fishing reels but not sure which I need, can you offer some advice? how is shark fishing in the San Carlos or Bimini canals? Where do I look for a saltwater fishing report in Maine? Why should I join a deep sea fishing club? Where can I find ocean fishing reports in California? Where can I find sea fishing reports? Have you tried tuna fishing on a charter? What should I ask before going? 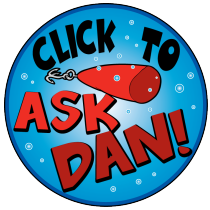 Which saltwater fishing forums do you visit? Is chicken livers a good saltwater bass bait im san diego ca? What fishing secrets do you have for the Texas Coast? Which fishing rod holder do you suggest I buy? dave brown on I’m going fishing in Delaware bay – what types of fish are there, and any recommended baits?